“Ceremonies at Monument,” Salt Lake Tribune, July 25, 1900. “Died,” Salt Lake Tribune, October 23, 1903. “Died,” Salt Lake Herald, October 23, 1903. “Dr. Faust’s Ideas for the Carnival,” Salt Lake Herald, May 28, 1896. “Echoes of the 24th,” Salt Lake Herald, July 26, 1893. “Fifty Years Ago Today,” Salt Lake Tribune, May 31, 1897. “Fifty Years Ago Today,” Salt Lake Tribune, April 15, 1897. “Fifty Years Ago Today,” Salt Lake Tribune, July 13, 1897. “Green Flake is No More,” Salt Lake Tribune, October 23, 1903. 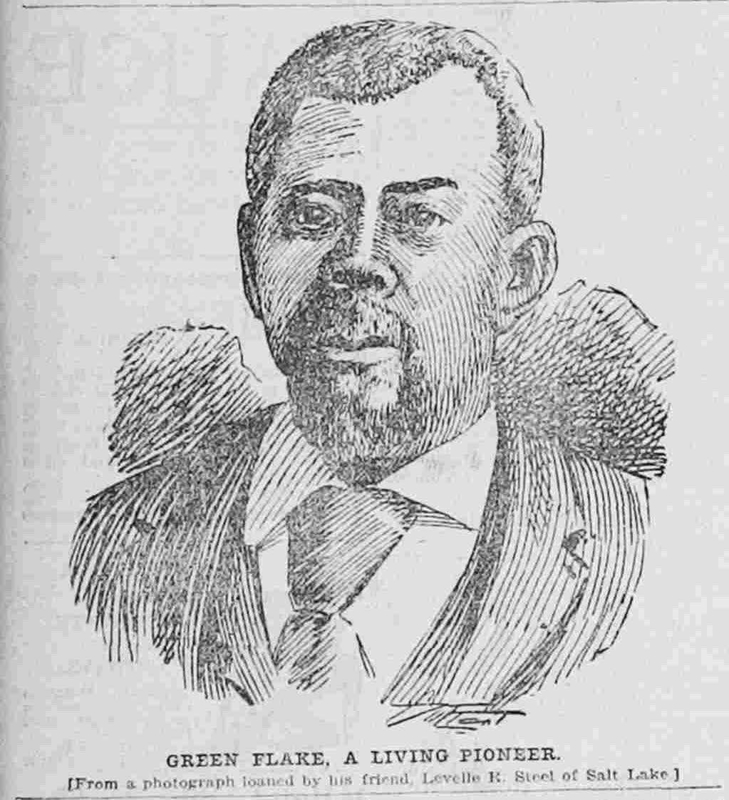 “Green Flake Passes Away,” Deseret Evening News, October 22, 1903. “Idaho…,” Union, August 7, 1897. “Locals,” Round Up, July 30, 1897. “Mining Notices,” Salt Lake Tribune, January 1, 1876. “Mining Notices,” Salt Lake Tribune, March 28, 1876. “News of the State,” Ogden Standard, October 23, 1903. “Only 8 Survivors of the Party of 163 That Settled Salt Lake in 1847,” Salt Lake Telegram, July 3, 1902. “Pioneers,” Salt Lake Herald, July 3, 1880. “Real Estate Transfers,” Salt Lake Herald, April 1, 1893. “Real Estate Transfers,” Salt Lake Herald, August 28, 1895. “Real Estate Transfers,” Salt Lake Herald, December 2, 1893. “Real Estate Transfers,” Salt Lake Herald, July 29, 1897. “Salt Lake News,” Ogden Standard, August 21, 1894. “Some Jubilee Visitors,” Salt Lake Tribune, July 26, 1897. “The Days of Forty-seven,” Salt Lake Tribune, August 21, 1894. “The Irish Americans,” Salt Lake Herald, August 16, 1894. “The Opening Day of the Jubilee,” Salt Lake Tribune, July 20, 1897. “The Pioneer Company,” Utah Enquirer, August 3, 1888. “The Pioneers of 1847,” Deseret Weekly, August 25, 1894. “The Twenty-fourth at Union,” Deseret News, August 1, 1888. “The Utah Pioneers,” Deseret Evening News, July 24, 1897. “The Veterans’ Reunion,” Salt Lake Herald, August 21, 1894. Bullock, Thomas. Journals 1843-1849, vol. 4. Mormon Pioneer Overland Travel, Church of Jesus Christ of Latter-day Saints. Clayton, William. Diary, 1847 January-December. Mormon Pioneer Overland Travel. Church of Jesus Christ of Latter-day Saints. Egan, Howard. Pioneering the West, 1846 to 1878, ed. and comp. William M. Egan  21-105. Mormon Pioneer Overland Travel, The Church of Jesus Christ of Latter-day Saints. Flake, Green. Mormon Pioneer Overland Travel. Church of Jesus Christ of Latter-day Saints. Flake, Green. Reminiscences, in Utah Semi-Centennial Commission, The book of the pioneers [ca. 1897]. Mormon Pioneer Overland Travel. Church of Jesus Christ of Latter-day Saints. Lyman, Amasa Mason. Diary, reel 1, vol. 8, 1-26 and 1-10, written by Albert Carrington. In Amasa Mason Lyman, Collection 1832-1877. Mormon Pioneer Overland Travel. Church of Jesus Christ of Latter-day Saints. Rockwood, Albert Perry. Diary, 1847 April-July. Mormon Pioneer Overland Travel. Church of Jesus Christ of Latter-day Saints. Joseph Lee Robinson Papers. MS 7042, Records, 1846-1847, Reel 1, Folder 4. Church History Library, Church of Jesus Christ of Latter-day Saints, Salt Lake City, Utah. Madsen, Steven K. Collection on Blacks in Utah. Accn 689, Box 1, Folder 1, and “Union, Utah Territory,” Box 1, Folder 2. Special Collections, J. Willard Marriott Library, University of Utah, Salt Lake City, Utah. United States, Census, 1860. Union, Salt Lake County, Utah Territory. United States, Census, 1870. Union, Salt Lake County, Utah Territory. United States, Census, 1880. Union, Salt Lake County, Utah Territory. United States, Census, 1900. Gray’s Lake, Bingham County, Idaho. Madsen, Steven K. A Union, Utah History (Union, Utah: Jordan Valley Sentinel, 1981), 46-58. Stapley, Jonathan A. and Amy Thiriot. “‘In My Father’s House Are Many Mansions:’ Green Flake’s Legacy of Faith.” Church History, Church of Jesus Christ of Latter-day Saints. “Flake, Green, Reminiscences, in Utah Semi-Centennial Commission, The book of the pioneers [ca. 1897].,” Mormon Pioneer Overland Travel, The Church of Jesus Christ of Latter-day Saints, accessed December 10, 2017, . John Brown, Reminiscences and Journals, April 3-7, 1844, 27, microfilm of holograph, MS 1636, Church History Library, Church of Jesus Christ of Latter-day Saints, Salt Lake City, Utah. Joseph Lee Robinson Papers, MS 7042, Records, 1846-1847, Reel 1, Folder 4, Church History Library, Church of Jesus Christ of Latter-day Saints, Salt Lake City, Utah. “Fifty Years Ago Today,” Salt Lake Tribune, May 31, 1897, 1; “More Pioneers,” Deseret News, July 19, 1897, 2; “Green Flake,” Mormon Pioneer Overland Travel, The Church of Jesus Christ of Latter-day Saints. “Mining Notices,” Salt Lake Tribune, January 1, 1876; “Mining Notices,” Salt Lake Tribune, March 28, 1876. “Green Flake Passes Away,” Deseret Evening News, October 22, 1903; “Green Flake is No More.,” Salt Lake Tribune, October 23, 1903; “Died,” Salt Lake Tribune, October 23, 1903; “News of the State,” Ogden Standard, October 23, 1903; “Died.,” Salt Lake Herald, October 23, 1903. “Only 8 Survivors of the Party of 163 That Settled Salt Lake in 1847,” Salt Lake Telegram, July 3, 1902; “Pioneers,” Salt Lake Herald, July 3, 1880; “The Twenty-fourth at Union,” Deseret News, August 1, 1888; “The Pioneer Company,” Utah Enquirer, August 3, 1888; “The Veterans’ Reunion,” Salt Lake Herald, August 21, 1894; “The Days of Forty-seven,” Salt Lake Tribune, August 21, 1894. “The Opening Day of the Jubilee,” Salt Lake Tribune, July 20, 1897, 1.